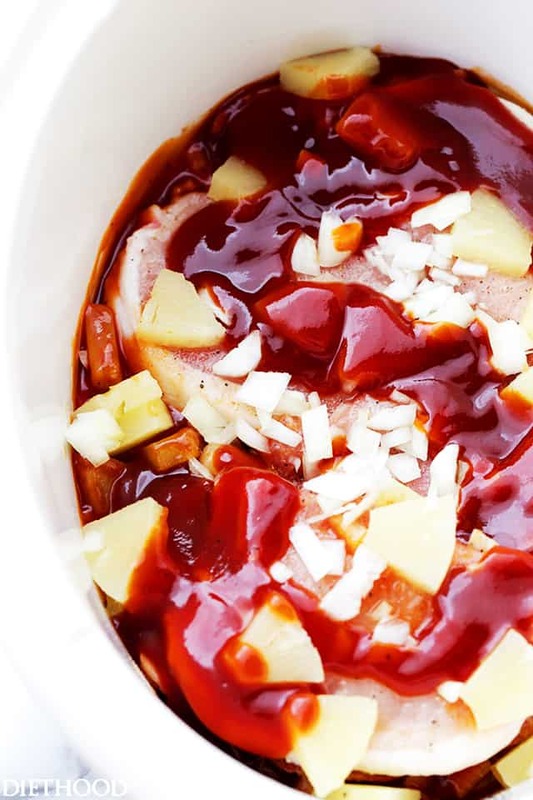 Crock Pot Pineapple Barbecue Sauce Pork Chops – Combined with tangy, homemade barbecue sauce and sweet, tender pineapple, this easy, family friendly recipe for Crock Pot Pork Chops is incredibly delicious, yet so simple to make! You KNOW it’s a good week when I’m talking about meatloaf and pork chops all within the same week! And, it is just going to get better because, Homemade Honey Barbecue Sauce and pineapples. On top of chops. Hello, internet besties! What is happening? How’s life? Where did the time GO?! Someone mentioned a high school reunion that we’re supposed to have this year and I was all like in denial and stuff?? How is it NOT 1998?! SO weird. I mean, there’s Z. Cavarricci’s still hanging in my closet, for Pete’s sake! Also, I think I might still have Netscape on my desktop. And a Nirvana CD!!! in the disk case. Okay okay. I’ll shuddup about the 90s. The best decade of forever and ever. BUT but but, speaking OF the 90s. That’s when I learned about sweet, pulled pork! I had no idea what it was. For one, I didn’t grow up in the South, and two, I grew up on Macedonian food/cuisine. I didn’t even know what a classic casserole was until I entered college. Heck, I was a junior in high school when I first tried a Grilled Cheese Sandwich! But no, I was not deprived of anything. I just had Turli Tava and Moussaka to look forward to every week. Anyway. So, like, many moons ago I had a friend give me a recipe for pulled pork because she knew I loved to cook. At the time, I had never heard of it, and fruit over meat was totally NOT my thang. No way. NO no no! And it was a HECK NO until I tried it. OH.Em.Gee… Holy mother of Mary! I prayed I wouldn’t finish the entire pork shoulder all on my own. It was da bomb. LOVE was staring me in the face. Best part of that recipe was that she only made it with about 3 ingredients! I’ll make sure to share what she gave me one of these days, but for now we’re going to focus on these pork chops which are based off that recipe, but not quite the same. 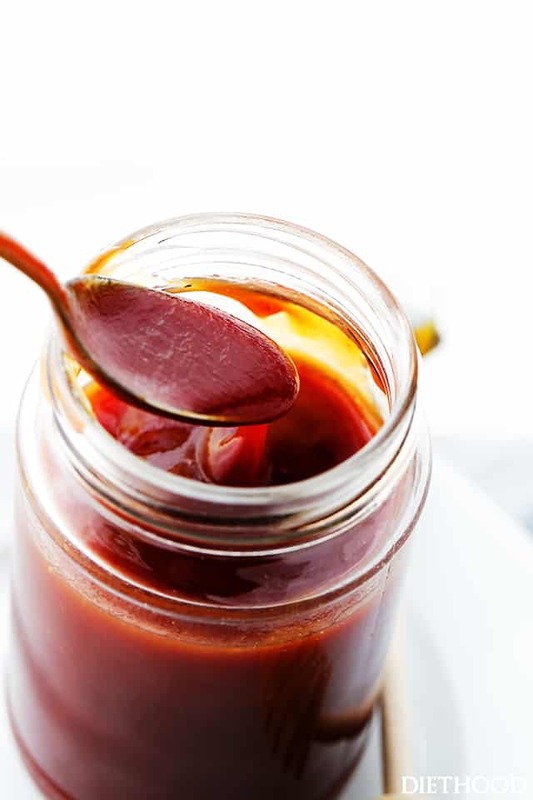 Made with my favorite Homemade Honey Barbecue Sauce, I think you will love how easy this is to make, and it’s downright delicious. The meat is tender and wonderful, and the entire thing is drenched in a little barbecue sauce glazy glaze. Yesssss. SO GOOD! Favorite thing about this? I drop it all in the crock pot, at the same time, and forgedaboutit. Oh hi, perfection. Can’t wait to hang out with you again, soon. 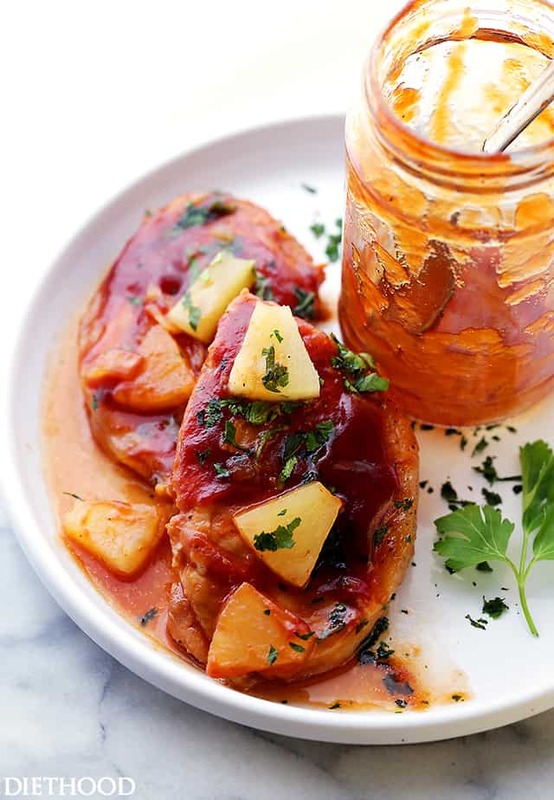 Combined with tangy, homemade barbecue sauce and sweet, tender pineapple, this easy, family friendly recipe for Crock Pot Pork Chops is incredibly delicious, yet so simple to make! Season the pork chops with salt and pepper; set aside. 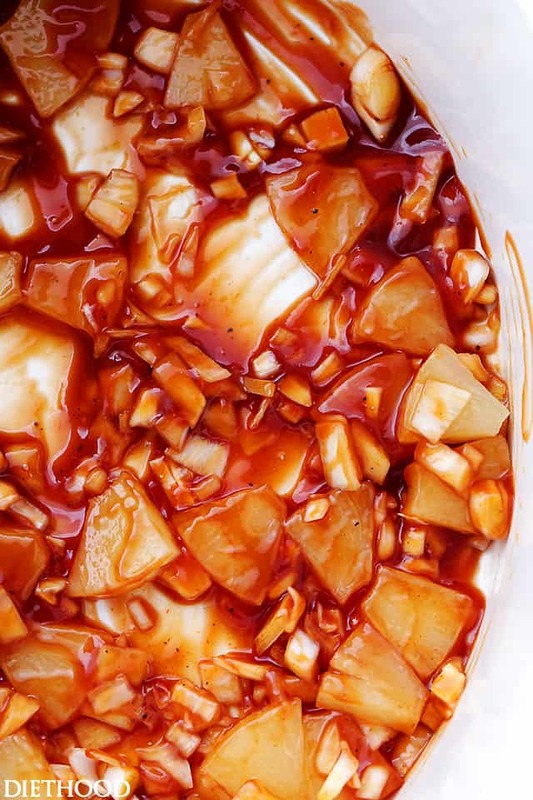 In a mixing bowl combine barbecue sauce, diced onion and pineapple chunks; mix until well combined. Pour half of the barbecue sauce mixture in the bottom of a 6-quart crock pot. Pour the remaining barbecue sauce mixture and reserved pineapple juice over the pork chops. Cover with a lid and cook on LOW for 4 to 5 hours, or on HIGH for 2.5 to 3 hours, or until done. Pork is done when internal temperature reaches 145F degrees. I like mine at 165F. Remove lid and transfer pork chops to a serving plate. Ok I had a frozen pork loin and it was taken out to late to use the crock pot. Can I use the instant pot? How long etc. in the instant pot do you think? Thank you for your advice I am not to experienced with the instant pot yet. This recipe looks delicious. 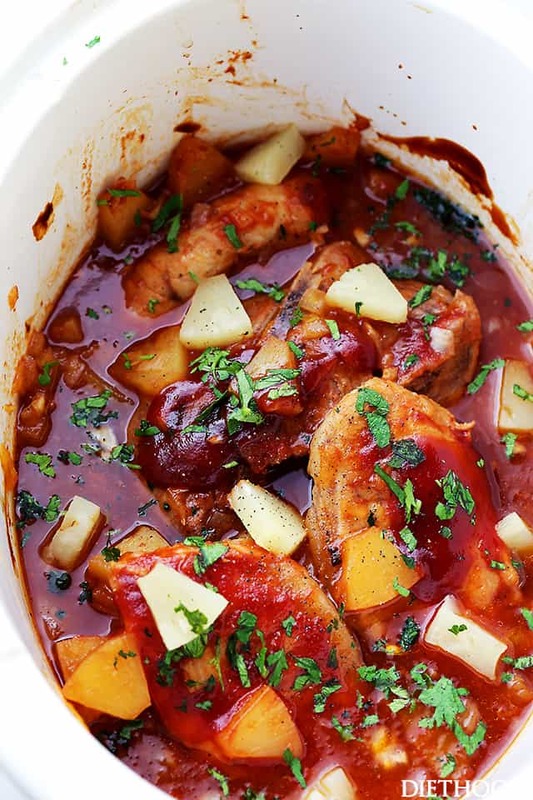 I haven’t prepared this in the IP, but please see this post for an excellent IP pork loin recipe and just follow her steps: https://www.simplyhappyfoodie.com/instant-pot-balsamic-apple-pork-tenderloin/ I hope that helps. good to know, fruit with meat scares me too! 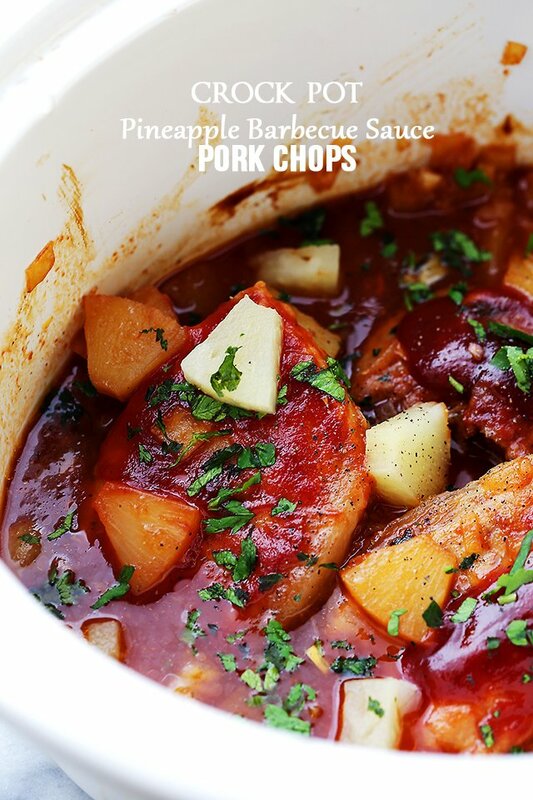 Saw this on weekly menus, had to check it out since my pork recipes are pretty basic and played out, thank you for this recipe! Yep, you most definitely can. Cooking time will be the same. Hi! I’m making this dish for my family. Looks delicious. But I’m a bit confused. Does it matter if I use pineapple chunks in syrup or in juice? Also do the chunks need to be drained of that liquid before adding it to BBQ sauce mixture? Or am I supposed to mix everything in the can with the BBQ mixture and then also put 1/3 cup pineapple on top? This recipe looks wonderful. Any idea of the cooking times and temps, to just bake this in a casserole dish? Thanks. I’m all about savory-sweet, so these pork chops look perfect! 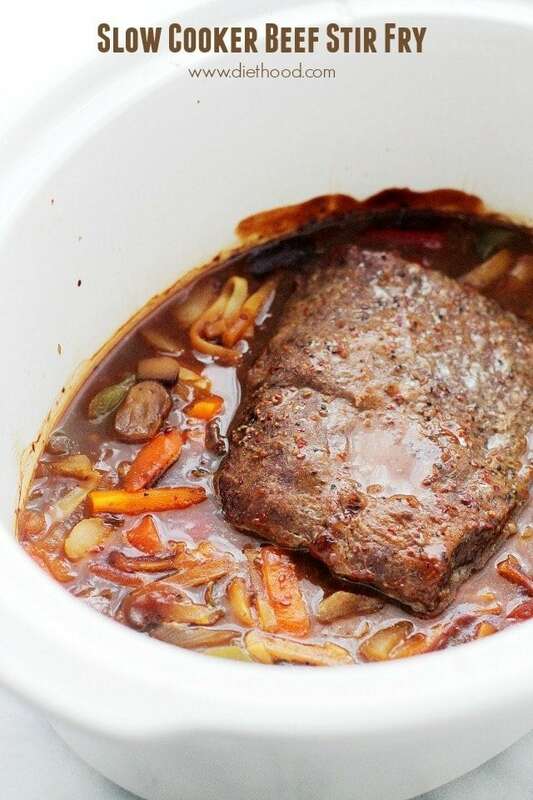 The slow cooker is a favorite of mine. It really does some amazing cooking! 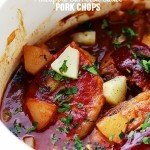 Love making pork in the slow cooker! 🙂 And I am about the pineapple in this. Sounds delicious! I am *all* about- oops! Pork chops are a weekly thing at our house… I love this creative way to make them in the crockpot! This looks so delicious. 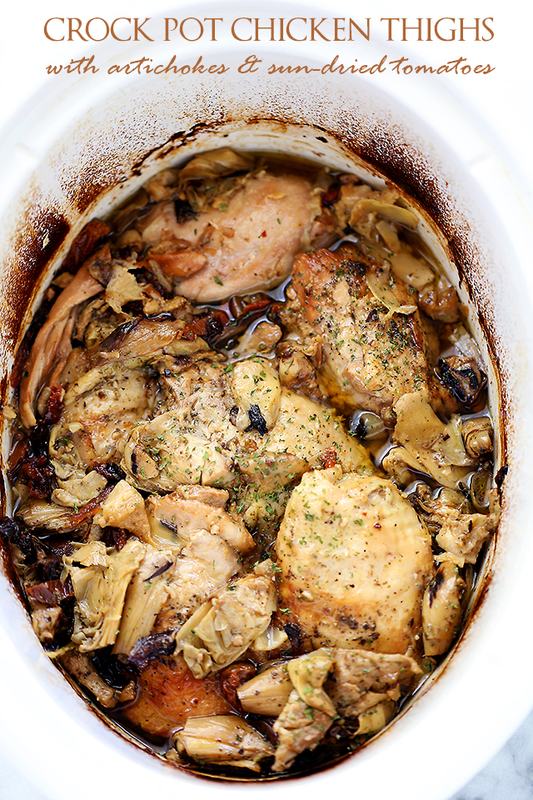 I am always looking for more recipes for the slow cooker! 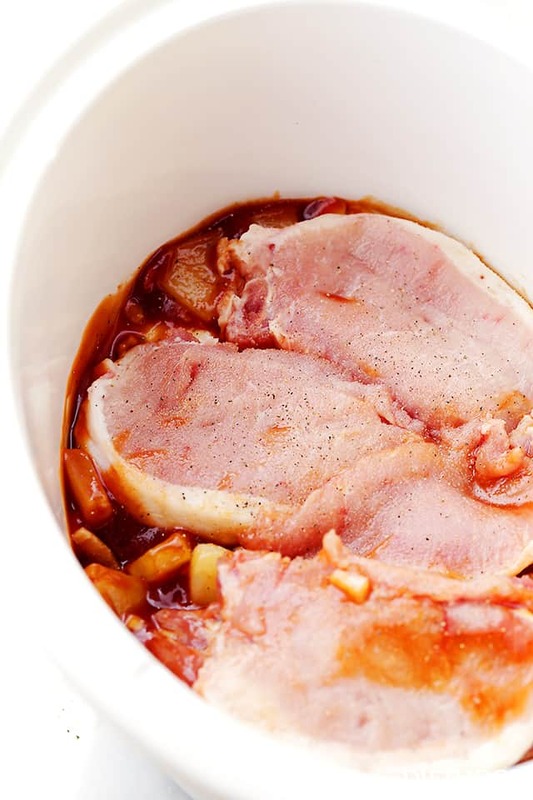 Why have I never thought to make pork chops in the slow cooker? These look fantastic!